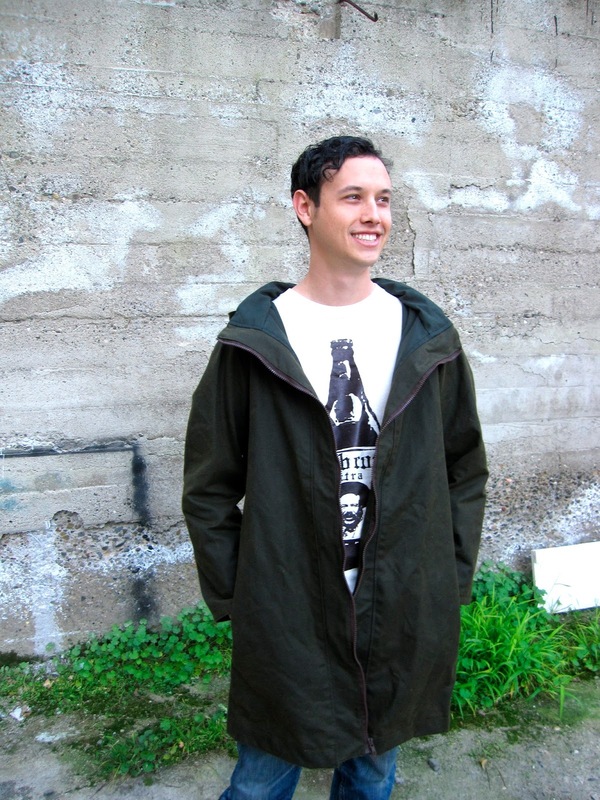 The jacket is made out of waxed cotton canvas, a durable waterproof fabric used in a lot of traditional men's outdoor wear like hunting vests and rain coats. Apparently it was first used by sailors to keep themselves dry. My manfriend, who has an eye for quality, first pointed out waxed jackets to me when we were camping in the rain, and when his birthday rolled around I knew I had to make him one. But how does one go about sewing with this material?? In the end, I think I did pretty well! And comparing the fabric to the cost of wool or other good coat materials, these prices aren't bad. Waxed cotton canvas wasn't easy to find, so if anyone else knows another source, let me know! As I cleverly crafted a plan to get his measurements (steal his jacket! measure his pants! ), all by himself he asked me to measure him for a jacket he wanted to get online. Perfect! I copied down the measurements for him and (covertly) wrote down a copy for myself. Gentlemen, it pays to give these things out! I knew for his jacket that, besides adjusting the measurements, I'd want to do away with some of the feminine details: namely, the elastic waist and the neck gathers. 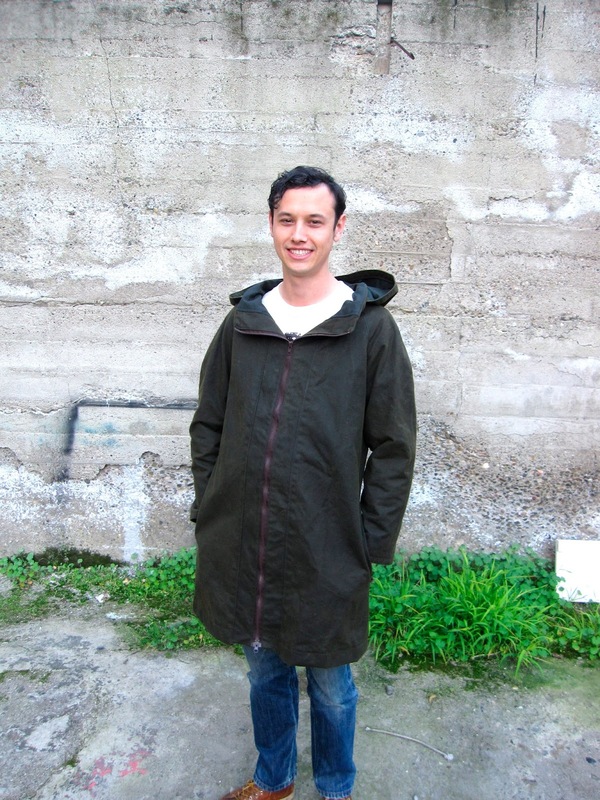 The elastic would be no problem - a fuller jacket looks fine on men. The neck gathers, however, posed more of a design challenge: they are cleverly made to give extra movement room that still tappers nicely down to the neck. I knew it would be hard to figure all these things out without making the pattern up first, so I made one for myself, of course! Since I had already bought 5 yards of the stuff, I made one up the regular way in my size first to get a feel for the pattern, then make my alterations on the second one. More on my version here! I have to say, I am thrilled with the pattern. The construction is simple and straightforward, and the pattern directions are great. It was curvy though! I consider myself to be pear-shaped, but this one went INCHES away from my hips. Trimming off the excess was no problem, though, and now it fits great. The remaining issue was that the waxed canvas is very thick and inflexible, and the jacket needed a lot of give. With these things in mind and my jacket most of the way done (and time running out), I started on his. 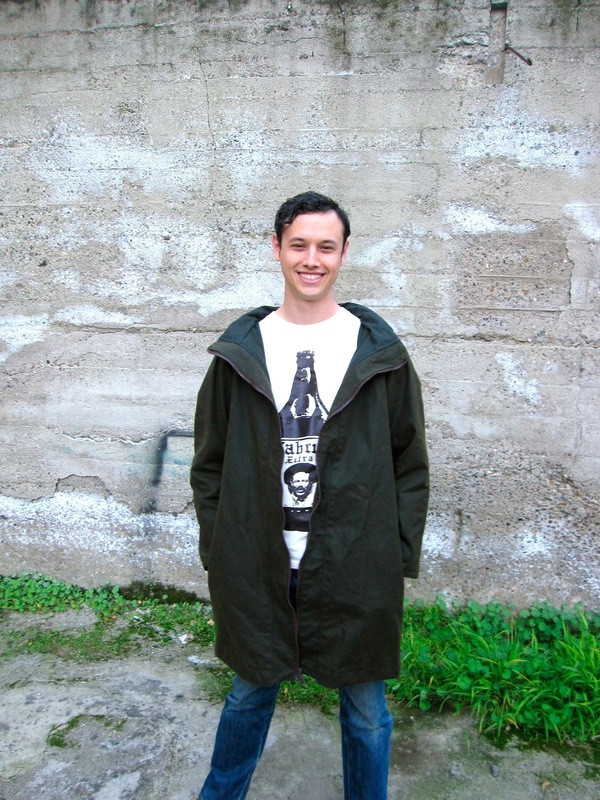 The Construction: Making the Minoru Jacket into a Men's Pattern! While the gathered sleeve eliminates a step from the sewing (thank you Tasia for crafting such an easy to sew, one-piece sleeve! ), for the men's Minoru this meant I had to draft a new two-piece sleeve using a combination of both patterns. Then, for the back, I added darts traced from a cape pattern to replace the gathers. For the fit, I took what I had learned about the jacket from my 'muslin' and added some extra width to the sleeves for additional wearing ease. I added length to the sleeves and the hem to size it up for a man, and ended up cutting a size 16 instead of 12 just to make sure. I had also noticed that the hood didn't quite fit into the zipper, and so I bought a longer zipper and made the opening a tad bit bigger. Finally, I narrowed the collar to make it less wide and girly. Almost there! To finish off the jacket and make it extra special, I added some final details. 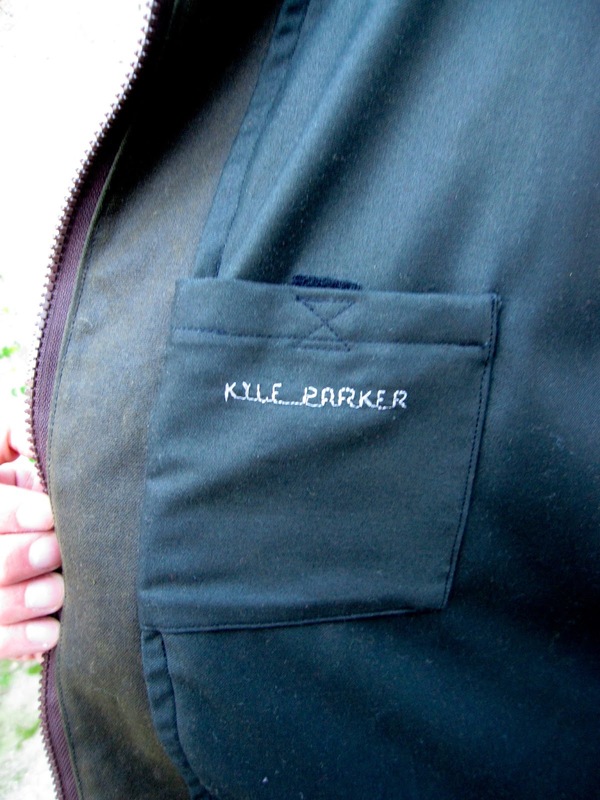 The jacket includes zippered in-seam pockets on the sides. Side pockets are a definite must, and I'm regretting not putting them in on mine. The zippers on the pockets make the jacket more sporty and secure, so he won't be worried that anything will fall out! 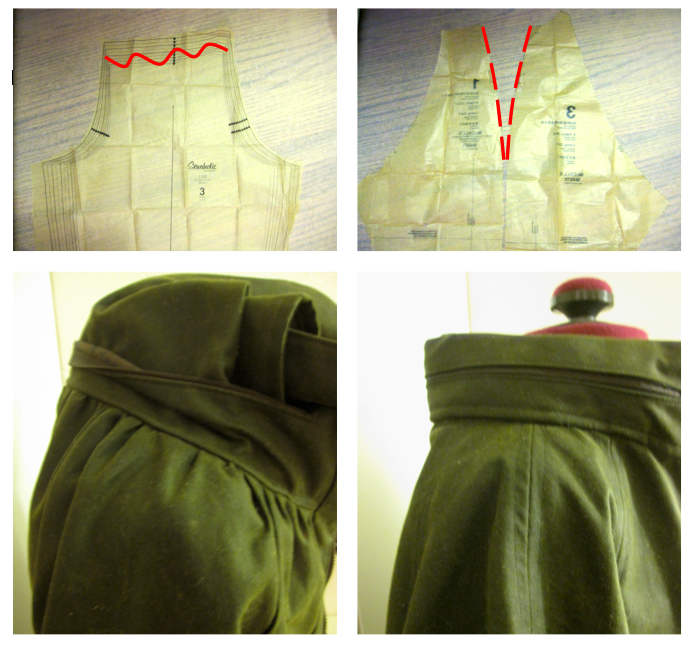 I believe I used Pins and Needles's zippered inseam pocket tutorial. You'll also notice that every zipper has a pull, which is very helpful for getting those tiny zippers open. Because the cording didn't burn well, I used fray check to seal off the raw ends. Following the pattern instructions, I did notice that there are no recommended ways for finishing the raw edges inside of the jacket. Next time I make one up (and there will be a next time! ), I will make sure to finish the seams before when I attach the collar to the jacket. In this case, I added on seam binding by hand. I almost never do hand sewing, but this was a special occasion! I finished it off with some very personal touches, including embroidering the inside pocket with his name and adding an in-seam tag with mine. I also made some personalized gift tags, which I love to do when giving something homemade as a gift. The second tag has care instructions. As for sewing with waxed cotton canvas, it wasn't as scary as I expected! The fabric sews up the same as any other heavy fabric, and my machine handled it beautifully with the help of my walking foot. I didn't even have a problem with the wax gumming up the needle, although I did get tons of wax on the foot and in my finger nails! The color does change and crinkle as you work with it, but this is what leads to the nice, worn-in look of these jackets. I did read that it will eventually need to be re-waxed, and it should NOT be washed. The final product certainly is heavy! I have never worked so hard on a garment in my life! Sewing every seam evenly, finishing all the edges, adding zippered pockets and special details. It is nerve-wracking sewing for someone else, and I was exhausted! Without being able to try the jacket on my model (and without the benefit of making a second muslin), I would say the fit of the jacket turned out OK. It is still a little tight across the back and under the arms, and the collar/neck opening is somehow too wide, which makes it threaten to fall off his shoulders (possibly also a product of it being too tight under the arms). As soon as I have some time I am going to add a gusset to the underarms to see if that will fix the problem. Conversely, the hood on his turned out too big. While the hood I cut for my version fits me perfectly, his hangs low over his head. (See comical picture below.) Because Tasia is so small, I wonder if the pattern grading itself is a little off, because I didn't see many versions done up in the larger sizes. Of course, I made so many pattern changes to tell for sure, but has anyone else noticed a weird fit as you go up in size? I did notice after the fact that the only somewhat negative review on PatternReview comes from a woman who made it up in a larger size. Overall though, I have gotten a great response on the look and style of the jacket. And when I overheard someone at a party complementing his jacket, I knew that I had done OK. He has also already gotten a ton of wear out of it despite the issues, and I am proud! The jacket also holds up great in the rain. Has anyone else ever converted a woman's pattern to a men's? I might not try it again, but it was quite an adventure! P.S. We ended up having a ton of fun on our little photo shoot. You can see my version here! The hood is oversized to fit over a bike helmet. Your jackets both look great. It's awesome that you were able to modify the pattern for him since she included so many little feminine details. I especially love the zipper pulls. You guys look great! I think it translated really well into a men's jacket. I'm excited to read the post on your version, as well. The sleeves minus the gathers look especially nice. Wow. 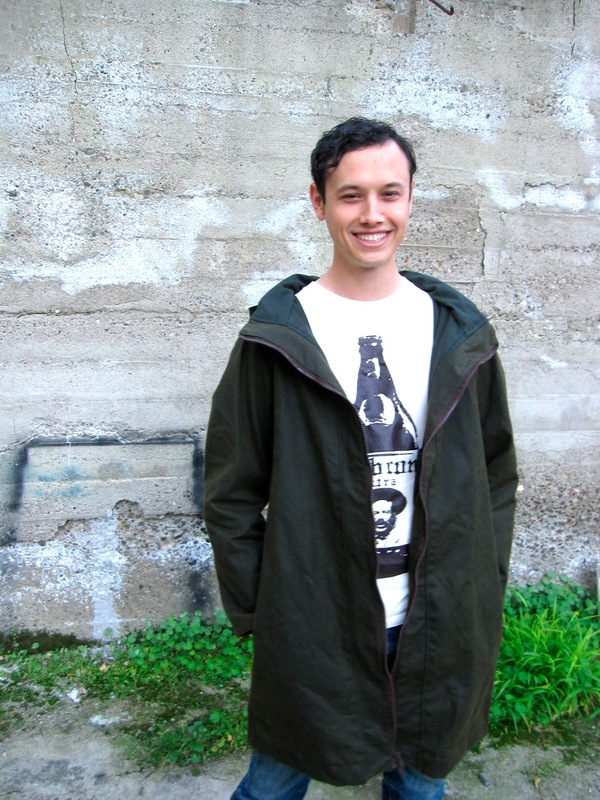 I am so impressed with how you managed to make it into a manlier coat. Lucky guy! I am sooo impressed! The changes you made to make it a man's and all the details, and even the hang tag! Bravo! Wow, what a great idea! And very well executed! I have to be careful not to show this to my man, he'll definitely want one :) This must go on my To Make list! Thanks for the inspiration! Amazing pattern transformation! Thanks for sharing your tips and recommendations. you two look adorable together!! Great post! I love all the details you included - pull tabs, labels, embroidery, binding. It's too bad the hood ended up so big. That's better than small like many of my husband's RTW jackets are because at least it will protect him in a rainstorm! I just wanted to let you know that I've put a link to your blog and a picture on my blog (https://threadtheoryblog.wordpress.com/) because I am compiling a list of sewing inspiration. If you would prefer no picture or no link at all, just let me know and I'll take it down right away! How fantastic! I had this idea as well. My boyfriend loved my Minoru and I have been thinking of making a man version for him too. I'm glad to see you have done it so I can now learn from you! It turned out really well. Very well done! Love both jackets! This is so great! What a special gift! I am about to make my husband the Collette Albion coat (my lilac version was a tester for his) and shall definitely bear your personal touches in mind. A great touch!